We all know that breakfast is one of the most important meal of the day. Make sure that your child gets nutritious foods that support their body for the day as well as for bone, muscle, & brain growth; like a bowl of oatmeal, with fresh fruit & almonds and a glass of milk. Make sure ½ of your child’s plate is filled with fruits and veggies with each important meal (breakfast, lunch, dinner). 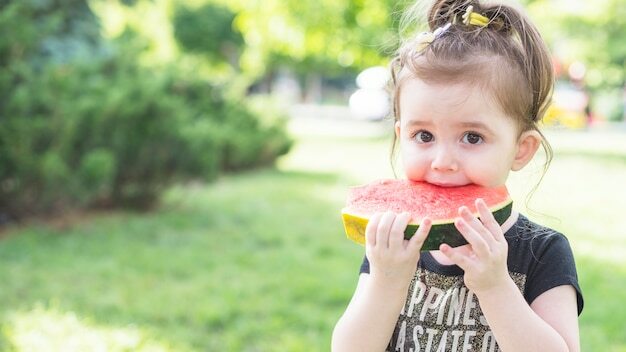 Replace sugary drinks & sodas with water, add slices of fresh fruit like strawberries, lemons or watermelons to your child’s drink for a delicious flavour. As staying hydrated prevents heat-related illness. Wearing sunglasses kids should definitely wear sunglasses while they are outside as it protects their eyes from the harmful rays. During the hot summer heat, make sure your child gets plenty of rest as it is important to prevent heat exhaustion while playing outside. Make sure your child brushes his/her teeth every morning and every night before bedtime. Poor dental hygiene may cause other health problems, mainly with digestion. Find activities your child enjoys doing – like riding a bicycle, swimming, playing games with friends. Minimum of 60 minutes of daily physical activity is recommended for all the children. When your child is riding a bicycle, skateboarding, always make sure they wear a helmet, elbow & shin guards and appropriate close-toed shoes.